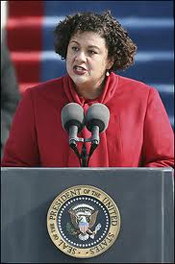 As the 2012 election nears—yet another historic one, most say—I think about Elizabeth Alexander, the poet who read her poem “Praise Song for the Day” on January 20, 2009, at the Inaugural of President Barack Obama. The perils of writing “public poems” are well known, and most said she fared well, if not spectacularly so. But in many ways it didn’t sound like her at all. Its lines lacked the usual tightness of her lines, and missing was her deep sense of gender, her intense, lyrical eroticism—something that probably would have been hard to place appropriately in a poem for an occassion like this. Besides poetry, Alexander has published fiction, critical essays and reviews in the Paris Review, the American Poetry Review, the Washington Post, the Village Voice, and other important periodicals, and collected her poetry in The Venus Hottentot (1990), Antebellum Dream Book (2001), and Body of Life, published in Chicago by Tia Chucha Press. A collection of essays, The Black Interior, along with a fourth book of poems came out in Fall 2003. 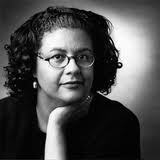 She has won NEA and Guggenheim fellowships, among many other awards. For me the poem that most represents those qualities I mentioned above—the intense lyricism and eroticism coupled with a deep sense of history and race/gender consciousness—is the three-part “The Josephine Baker Museum,” Josephine Baker embodying the intersection of eroticism, race, history, and feminism as boldly and ironically as anyone ever has. Here are a few lines from “The Wig Room,” Part Three of the larger poem. of wigs in the dark. This part echoes Paul Laurence Dunbar’s “We Wear the Mask.” Masks, wigs, more masks, some grinning and lying—you often have to do all these to fool, even mock, those that threaten your humanity, sometimes your very survival. It’s not dishonesty in the normal sense, but a tactic only those who have faced overwhelming racial—and gender—odds will ever understand fully. √ Go to a list of Black Writers written about on this site, OR to the Teaching Diversity main page. Go here for a list of poems and poetry commentary on this site. This entry was posted in Black Writers, Diversity & Multiculturalism, Poetry and tagged 2012 Presidential Election, Barack Obama, Black Wriiting, Black Writing from Chicago, Chicago Writing, Elizabeth Alexander, Josephine Baker, Paul Laurence Dunbar, Praise Song for the Day, Presidential Inauguration, Teaching Diversity, Tia Chucha Press, We Wear the Masks, Wrigley Field. Bookmark the permalink. Obama Inaugural | Richard R. Guzman” ended up being a fantastic posting. If perhaps it included even more pix this would most likely be quite possibly even better.